I find inspiration by thinking about what's lacking in my closet! I usually create patterns for things that I'm knitting for myself or for my daughters. When I'm working on a book or pattern booklet, I think about one main concept, and then try to come up with offshoots of that main idea. My end goal (when working on a book or booklet) is to have a set of designs that create a collection. The designs share some similar features or a commonality of concept. I'm known for designing garments that are knit all in one piece from the neck down to the hem. I prefer to design raglan sweaters because I think that they fit better than sweaters knit in pieces and because I like being able to try on my knits as I go. I also have just found a real love of lace knitting. I've recently designed several shawls. I wouldn't have pictured myself as a "shawl person" but now that we live in the South West, I'm into little knits that I can take on and off as the weather changes. It's really not cool enough here to justify a whole wardrobe of sweaters. When I wrote my first book, Fitted Knits, I started most garments at a 32 inch bust and sized them from 48 to 54" bust. I determined that based on the size range that is typically requested when designing for magazines. When I wrote my second book (Glam Knits) I tried to size most of the sweaters to 54" bust measurements because i wanted to accommodate a larger range of sizes. I've actually received requests from some smaller women to even include more sizes on the smaller end of the spectrum...so if I do a third book, I'll probably even do a wider range of sizes. I do look at other people's work. I think it's important to have an idea of what's going on in the industry and what the trends are. I tend to stick to my own sense of style, so I'm not worried about being overly influenced by another designer's work. This debate has been going on for years in one form or another. 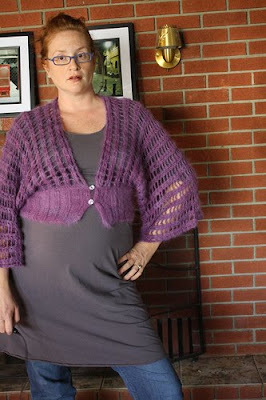 A few years ago, the debate was over whether there were too many patterns for novelty yarns, then too many patterns with big needles...then too many free patterns. It's always something. I really think that there's room for everyone. For every knitter there's a particular style of pattern writing that speaks to them. I think that people should be free to knit, write, and design the way that they want to. If a large number of knitters are requesting simplified patterns, designers will accommodate them. At the same time, I don't think that every designer should be forced to write simpler patterns. I currently have three knitters that I call on at various times to help me complete projects. It's been hard for me to find knitters who take sample knitting seriously, so I keep my list very small. I don't have a formal business plan. My business model has recently changed dramatically with the opening of my online knitting classroom (http://stefaniejapel.ning.com/). I've set up several goals for myself, and I do have long-range plans. It's been difficult for me to stick to a set timeline, because I've got two babies at home. One just turned two in January, and one is a newborn. I'm still trying to figure out how my days are going to work. Once I can get a grasp of exactly how many working hours there will be in a given week, I'll be able to be more specific about a timeline and what I think I can accomplish. I have several people that I look to as mentors (though they may not even realize it!) I've been very lucky to sign on with the Stitch Cooperative (http://stitchcooperative.com/) are a group of women designers and businesspeople. They have been invaluable as a sounding board. It's been great to have a group of people to work with in getting my ideas out there. Because my business grew so organically on its own, I haven't really emulated another business. I started out as a blogger in 1999 and things just grew for me out of that. If I had to choose a business idol, it would be Jennifer Hansen of Stitch Diva Studios. Jennifer is a brilliant businesswoman. Without the Internet, I'd have no business! I started online, my first patterns were published online, my shop is online, I teach online...everything is online! I do. I think that one needs another person's eyes on the math, and even on the formatting and writing, just to make sure that everything makes sense and looks as good as possible. This is a really hard question. Before my daughters were born, I could just knit all the time, be online all the time, and go to all of the conferences and shows. But now, I really don't WANT to be online all the time, and I don't WANT to be away from my kids every weekend. I try to work late at night after they're asleep, and during nap times. I never want to ignore my kids in order to pay attention to what's happening on my computer. I hate to admit this, but I don't take criticism well. I tend to take negative comments really seriously and very personally. I think that because I love knitting so much, I tend to fall in love with my garments and so it's like some one's bad-mouthing a friend of mine. I totally ignore my Amazon.com book reviews because I think that people are so much more harsh online where things are pretty anonymous than they'd ever be in person. If I *do* run across a critique, I read it and then let it sit for a while before responding if it's something that needs a response. If it's not something that needs a response, I tend to just let it lie. I really am not a person who's going to get into a big public online argument. I decided to go into knitting full-time when I was pregnant with my first daughter. Fitted Knits had already sold 25,000 copies, and I was doing pretty well with online pattern sales. At that time, I'd been designing part - time for about 8 years. Before you sign any book contract, hire an agent. Robin, I've just discovered your blog via Marnie and am really enjoying your interview series. Did Stephanie have any suggestions on the best way to find an agent?